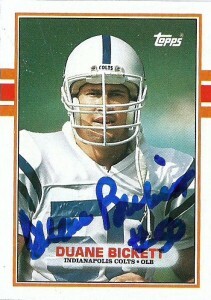 Duane Bickett played collegiately for USC at linebacker. 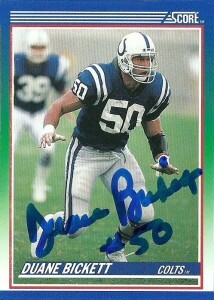 He’d be taken off the board with the 3rd overall pick by the Indianapolis Colts in 1985 by then coach Rod Dowhower. After a supurb rookie campaign Bickett was named NFL Defensive Rookie of the Year, recording 141 tackles, 6 sacks, and a fumble recovery at right outside linebacker. A man mountain at 6-5, 250, Bickett had a knack for always finding the ball in the backfield and shedding would be blockers. He was considered one of the most complete linebackers of his day. An incredibly slow start the following season (1986), by the team ushered in a new era under head coach Ron Meyer, but that didn’t stop Duane from recording a career high 144 tackles. (In fact Duane recorded 7 straight seasons of 100 or more tackles when all was said and done.) His 1987 season sparked his only Pro Bowl berth, as he notched 8 sacks, 2 FF, and 113 tackles. Indianapolis began to slide backwards and despite Duane’s solid play, the team hit bottom by 1991 with a 1-15 record. Still Duane put up respectable numbers (5 sacks, 125 tackles), but by then his numbers were largely ignored outside of Indy. Ted Marchibroda returned as head coach of the team the following season. As Bickett’s numbers finally dipped under the century mark in tackles in 92 (89) and 93 (97), Duane would be allowed to test the free agent waters in 1994. The Colts simply couldn’t afford to keep Bickett any longer. The lifetime Colt ended up in Seattle in 1994, as he wanted to play on the West Coast closer to California, but Bickett only started 1 game recording 7 tackles playing second fiddle to Rufus Porter. Again in 1995 he came off the bench for the Seahawks and recorded 1 sack, 1 fumble recovery and 5 tackles. Duane signed with the Carolina Panthers after the season, and recorded 2 sacks and 7 tackles but persistent back and foot problems had been creeping up on Duane so he decided to retire after the ’95 season. Duane is considered one of the first ‘true’ Indianapolis Colts, since the team had played its tenure in Baltimore since its inception. He is also the only Colt to win defensive rookie of the year honors. 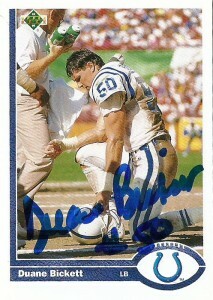 Bickett is also notable for his appearance in both Tecmo Bowl and Tecmo Super Bowl for two woeful Colts teams. Duane had quite the equipment manager’s nightmare quirk, as he frequently requested up to 3 uniforms on game day so he could choose the one that matched his current mood and perfectionist style of play. Duane is apparently an art enthusiast (especially impressionism) who enjoys his time visiting museums. He currently lives in Southern California and is a regular donor to his former High School in Glendale, California.